Bank & Vogue offers a wide variety of used toys, including hard and soft toys. 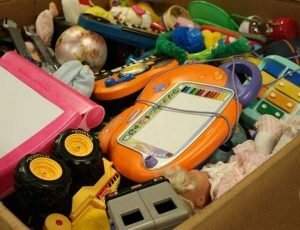 We sell used toys and work with suppliers who sort the product to remove larger toys over 12 inches in height, and remove damaged toys and electronics as best as possible. Hard toy loads normally include cars, dolls, used games, arts and crafts supplies, building blocks and more. Second hand toys are commonly packed in gaylords or capsacks. They are typically loaded with other used products but are also available in full loads with a minimum weight of 20,000 lbs. Contact Bank & Vogue today to buy used toys in bulk packaging for your business. Bank & Vogue also offers bulk used soft toys for sale, which include undamaged stuffed animals, larger sizes (taller than 24 inches) removed. 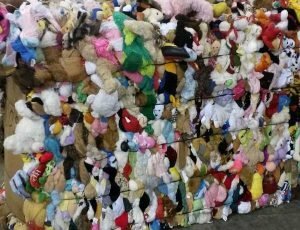 Our toys come from used toy donations and are baled for you. Contact us today to begin buying used toys in bulk for you business today. We encourage our suppliers to bale and wrap soft toys in 1000 lb bales. They are typically loaded with other used products. We also have full loads available that typically weigh 20,000 lbs or more. Contact Bank & Vogue today to place an order or for more information about shipping across North America and internationally. We Also Sell Store-Return Toys! We work with major toy retailers in the United States to produce valuable loads that are in demand in many regions of the world. While there are some countries that do not accept the importation of store return toys, we have been moving these products for many years and can help new and existing customers. The result has been a wider variety of product available and more revenue generating opportunities for our customers. Please click here for more information on our store return toys.